I've been on a journey to simplify my life for about two years now. It's just one step in my quest to live the life I want to live. This simplification has started with stuff. You know, the stuff we accumulate and can't seem to live without. It seemed pretty easy when I set simplification as a goal for myself, but putting it into practice has been a lot harder than anticipated. Be clear about your personal goal for simplification. Before making a purchase, ask if the purchase fits into your personal goals. Use a “box and fetch” technique to identify thing you actually use. Think use, donate or discard. Today I was reminded of my goal by the mere act of opening the email below from Sur la Table. Buy two spatulas and get one free. Why not? I love spatulas and I can always use another, right? I clicked through and looked at the colorful options. Before I clicked to purchase I decided to pour myself a cup of coffee. This took me into the kitchen where I glanced at the crock holding my kitchen utensils. You can see as well as I that I do not need any more silicone spatulas. Perhaps I should actually get rid of one or two that I have! I find that mindfulness is essential to keep me on track in my simplification journey. This mindfulness served me well about a week ago on a day of shopping with a couple of my friends. Mindfulness was particularly essential in The Container Store. Have you been there? I love the store for poking around. Who knew there are so many boxes, shelves, bags and various organizational tools? I wanted to buy everything. Just think how all my stuff could be organized! Mindfulness kicked in just in time. Instead of putting this and that into my cart I walked through the store considering how each of the organizing tools I was attracted to might fit into my goal of simplifying my life. I asked myself if the containers would actually make it easier and simpler to manage my stuff or would they just hide stuff I didn't really need. In the end, I left the store without buying anything, but more determined to get rid of more of the stuff I was thinking about "organizing". My friends and I had a conversation that day about Marie Kondo's best seller, The Life-Changing Magic of Tidying Up: The Japanese Art of Decluttering and Organizing. Two of us had read the book and we had plenty to say about it. The one thing I took from the book was this concept of mindfulness. Much of the rest of the book I found to be too restrictive in approach. It's worth reading, though, because you may find something there that helps your simplification journey. 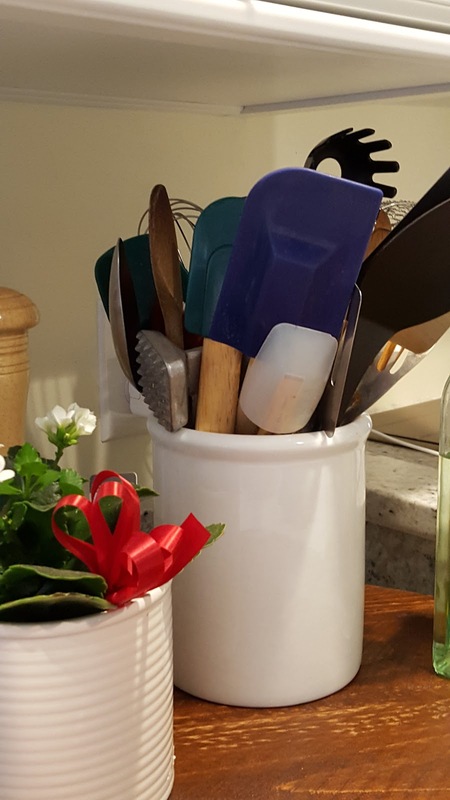 Even though I started this post writing about silicone spatulas and that I may still have too many, I feel like I have been most successful in my attempt to simplify in my kitchen. Simplification there was facilitated by a complete kitchen remodel this past year. I had to remove everything from the kitchen prior to the demolition. I used the packing up phase to discard and donate all the items for which I obviously no longer had a use. Then, when moving back into the kitchen I only brought back things I use frequently. I left everything else in boxes and only brought in items as I found I needed them. I call this my box and fetch technique. This encouraged another round of discarding and donating. Now, after ten months, I have one small box of kitchen gadgets that I plan to hold onto for another few months. If the items in that box haven't been needed by then they'll be donated. All in all, thanks to mindfulness, I feel more organized in the kitchen than I was a year ago. My simplification journey continues, but just like all things that are worthwhile this journey takes time...and mindfulness.